AUSTIN, Texas, May 15, 2012 (ENS) – A Texas District Court judge Monday issued a letter announcing that he intends to rule against the state environmental agency’s air permit for a proposed power plant in Corpus Christi. The ruling by Judge Stephen Yelenosky comes in a lawsuit brought by environmental groups seeking to reverse the permit authorizing the proposed 1,320 megawatt, $3.2 billion Las Brisas Energy Center planned for Corpus Christi’s Inner Harbor. Sierra Club, the Environmental Defense Fund, the local Clean Economy Coalition, and a coalition of Texas cities joined forces in 2009 to challenge the plant’s air pollution permit, which the Texas Commission on Environmental Quality issued on January 26, 2011. In his letter, Judge Yelenosky agrees with their appeals concerning the Texas Commission on Environmental Quality’s failure to require adequate technology to handle the plant’s fuel source, the agency’s failure to comply with National Ambient Air Quality Standards and a lack of accountability for how petroleum coke would be stored and transported to the plant. “Here, the worst-case scenarios factually and legally were not modeled,” Yelenosky wrote. The judge’s opinion letter states that the order may require an additional hearing or briefing to determine whether a permit reversal, or reversal and remand is appropriate. “The court has announced that it intends to rule against the TCEQ because, in issuing the permit, TCEQ committed a number of critical legal errors,” said Environmental Integrity Project attorney Erin Fonken, representing the Sierra Club in the lawsuit. Among the legal errors are TCEQ’s failure to require the new power plant to comply with the Clean Air Act’s protective air toxics standards. Another error is the failure to adequately account for the millions of tons of petroleum coke that would be piled on the site before being burned in the power plant’s main boilers, said Fonken. The permit would allow emission of air pollutants from the petroleum coke-burning power plant near schools and residential neighborhoods, the environmental groups argued. Petroleum coke, also called Pet coke or petcoke, is a carbonaceous solid derived from oil refinery coker units or other cracking processes. Corpus Christi hosts at least a dozen refineries. The Refinery Row districts of Corpus Christi are primarily low income, Afro-American and Hispanic communities. The plant faces local opposition from these residents, from city officials, and from some business leaders. It has the support of the Central Bend Labor Council and its 26 affiliated local unions, the South Texas Chapter of the Associated General Contractors of America, and the Port of Corpus Christi. In addition to the power plant, Las Brisas is planning to upgrade the existing bulk terminal at the Port of Corpus Christi to handle more coal, petroleum coke, and other dry bulk commodities, increasing port traffic three-fold. In the first 10 years La Brisas says the project will yield $900 million in local spending, $400 million in local tax revenues as well as 1,300 direct and 2,600 indirect jobs for local workers over the four to five year construction period. “This court decision is great news for the leaders and residents who are working so hard to build a brighter future for Corpus Christi,” said de la Fuente. 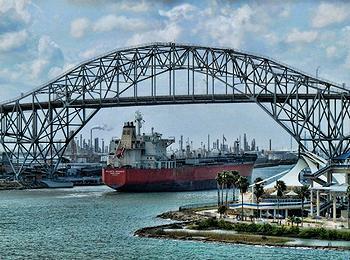 Las Brisas is not the only energy development on Corpus Christi’s Inner Harbor. The first wind energy farm to be located on industrial port property in North America was opened in March by Revolution Energy with six wind turbines. Judge Yelenosky’s announcement is the latest legal setback for the proposed power plant, which, if built, would emit 12 million tons per year of greenhouse gases, as well as thousands of tons per year of pollutants that contribute to smog pollution and health impacts such as asthma attacks and heart disease. The TCEQ issued the Las Brisas air permit over the objections of the federal government, the recommendation of two administrative law judges and the TCEQ Office of the Public Interest Counsel, attorneys employed by the agency who are tasked with protecting the public interest. The U.S. Environmental Protection Agency now is considering a separate permit application for the plant’s greenhouse gas emissions, and that permit also will need to be issued, before the plant can start construction.